Timothée Chalamet is the next actor to publicly distance himself from director Woody Allen. The young actor announced in an Instagram post that he regrets working for Allen in the director’s forthcoming film A Rainy Day in New York and will donate his entire salary from the film to three different charities: Time’s Up, RAINN and the L.G.B.T. Center in New York. The young actor explains that he cannot speak directly about his decision to work with Allen due to “contractual obligations”—however, he does say his initial interest in the film stemmed from being “a young actor trying to walk in the footsteps of more seasoned actors” whom he admires. Chalamet states that he ultimately decided to donate his salary because he wants “to be worthy of standing shoulder to shoulder with the brave artists who are fighting for all people to be treated with respect and dignity they deserve.” Chalamet’s co-stars on the film, Jude Law, Liev Schreiber, Selena Gomez and Elle Fanning, have remained silent about working with Allen, while Rebecca Hall donated her salary from the film to Time’s Up, as well. Hall starred in Allen’s Vicky Cristina Barcelona in 2008 and says she regrets working on that project, too. Allen is facing severe backlash after accusations of sexual abuse by his adopted daughter, Dylan Farrow. Several high-profile Hollywood figures have denounced Allen, including Oscar winners Natalie Portman and Mira Sorvino, and showrunner Shonda Rhimes, as well as actress Ellen Page. Farrow, however, specifically called out actors who had worked with him, including Greta Gerwig, with whom Chalamet worked in Lady Bird. Greta did issue a statement expressing her regret for working with the director, which you can see here. Chalamet has been on an international press tour for his award-winning film Call Me By Your Name which may snag him an Oscar nomination for Best Actor this year. Chalamet could make history if nominated—a win would make him the youngest Best Actor Oscar recipient ever. The young star has previously appeared in Christopher Nolan’s Interstellar, the television show Homeland and a few other films. 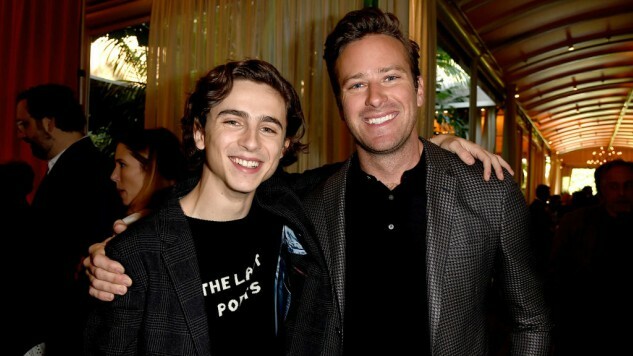 He received a Golden Globe nomination, Critics Choice nomination, SAG nomination and BAFTA nomination, all for his performance in Call Me By Your Name, propelling him to stardom. See Chalamet’s Instagram post below. “Thank you, Timothée Chalamet, for supporting The Center and standing against sexual violence,” New York’s LGBT Center tweeted.